Our company is proud to offer a viable solution for the ever increasing demand for mattresses recycling. We currently serves clients from various commercial sectors such as retail chains, hoteliers, hostels, and various smaller local businesses and non profit origination’s. SBC LLC has become the choice of many businesses wishing to dispose of their difficult waste streams such as mattresses, as they prefer to use one reliable recycler for all their recycling needs. We have a 100% landfill avoidance policy on all mattresses. Mattress Disposal, a member of the SBC LLC family of companies, opened for business in January 2004 to meet the growing demand for recycling in Portland Oregon and the surrounding metropolitan area. In addition to our standard business recycling pickup in Portland Oregon, you can also count on SBC Recycling for high volume recycling services. Mattress Disposal’s operation is part of a planned resource recovery facility that includes high volume recycling and a processing division for high volume recycling needs. SBC Mattress Disposal is pleased to announce solutions to address the growing need for large volume recycling of mattresses and other large household items. The success of our recycling program depends directly upon the ease in transportation of the heavier and higher volume loads. For companies or organizations with large volume recycling needs (100-plus items to recycle), SBC Recycling will provide free pallet pickup, and an online status report of collection programs. We extend our services to businesses, schools, churches, organizations and individuals. We can pick-up your items for a small fee. The cost varies according to the distance that our truck has to travel to pick up your items. Unlike most other recyclers we do not charge for everything we receive, but only for those items that are costly to recycle and / or difficult to haul. This can save a company hundreds or even thousands of dollars in disposal costs alone. Get started with our easy online Electronic Recycling Program. It is a easy 4 step program, which gives you an instant quote tailored to meet your needs. The whole process takes less than 60 seconds to complete, depending on what you have to recycle. Regardless of the size of your business, whether big or small, you can always count on us for prompt large volume recycling pickup in Portland Oregon and the surrounding metropolitan area. 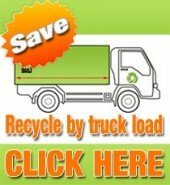 Click here to schedule a pick-up by truckload now, or contact us for a fast quote for your recycling project.